Colonel Jonathan Hasbrouck’s Tory Son Cornelius? Governor George Clinton of New York sat down at his desk, in January 1781, to read a painful letter from Judge Robert Yates. The letter concerned the son of a now deceased acquaintance, Colonel Jonathan Hasbrouck. It involved his oldest son, Cornelius Hasbrouck, who as Clinton read the letter, sat in a Kingston jail tried, convicted, and branded for stealing “sundry oxen and goods and chattels of the United States of America”. Intrigue surrounds the oldest surviving son of Colonel Jonathan Hasbrouck of Newburgh. He has been labeled a Tory, and little more than that has been said about him. The family histories are silent or repeat that he fled to Canada as a Tory. What if the histories were half right? According to documents in the Ulster County Clerk’s Office in Kingston, New York, Cornelius was in Upper Canada by 1818. Maybe Cornelius was not a Tory, but his actions in the early 1780s led people to label his actions as suspect in a scandal that not only caught the attention of Governor Clinton, but the Continental Congress. In the City of Newburgh in the Hudson Valley, a fieldstone house still stands, and has stood mostly unchanged for over two centuries. 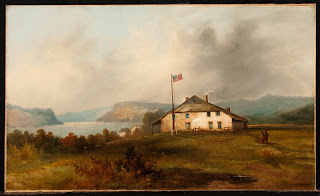 It has bared witness to British flotilla’s menacing the Hudson River, which it overlooks, to the arrival of General Washington who remained in the home, making it is his headquarters, from 1782 to 1783. However, before the Washington’s arrived, it was the farm of Colonel Jonathan Hasbrouck and his wife Tryntje Dubois. Tryntje Dubois and Captain Jonathan Hasbrouck’s household welcomed the birth of Cornelius Hasbrouck in 1755, their second son. Little is known about Cornelius Hasbrouck’s early life, other than a receipt showing that he attended school and the deaths of his brothers Joseph and Abraham within a short period of time of each other. Cornelius, followed in his militia colonel father’s footsteps, becoming involved in the American Revolution first as a secretary for the local committee of safety, then an ensign, and still later he was suggested as a Lieutenant. become quite a busy place. This especially held true along the water front. Colonel Jonathan Hasbrouck, and subsequently his family, profited greatly from the Continental Army using Newburgh as a depot for supplies, and shipping point for supplies. This importance, in turn, made the mills that Colonel Jonathan Hasbrouck passed on to his sons very valuable. In addition the Hasbrouck’s vast meadows were used for the army’s livestock. Newburgh’s importance as a storage point continued to increase sometimes bringing the military into direct conflict with the populace. According to the testimony of John Simpson and John Stillwell, the army, as part of an agreement, kept livestock in the pastures of Cornelius Hasbrouck. The problem that Hasbrouck encountered was that these cattle were not only, in his opinion, damaging his fields, but that he had not been paid for some time for keeping the animals. This included sometimes housing the Continental Army drover when he was not staying with Henry Smith, a neighbor of the Hasbrouck’s. Hasbrouck became increasingly irate at his treatment by the army voicing his anger to both Stillwell and Simpson. He was tired of waiting for money owed him. Cornelius made a fateful decision that would cost him dearly. John Stillwell, a local inn keeper, and also employed as a butcher for the Continental Army, was approached by Cornelius. He complained to John Stilwell that an ox that kept escaping from his pasture, and if Stillwell saw the ox to just kill it. If he decided to kill it he could either keep the meat as payment or Hasbrouck would pay him for his services. John Stillwell realized the seriousness of what Hasbrouck asked. He was aware that this was a government ox, and told Hasbrouck no unless he produced a slaughter order from the army. However, Hasbrouck was persistent and approached Stillwell again this time telling Stillwell that the two of them could make money by stealing some of the livestock. If they decided to take the cattle that the time to move was now. This time Stillwell went along with the idea enlisting the help of another individual, John Simpson, who Cornelius knew because he sold land to him. The badly burned deposition because it has been in the great fire in the New York State Archives, relates that shortly after Stillwell and Simpson let out the cattle Hasbrouck appeared to look over the animals. Stillwell related to the court, that he became concerned that many of the cattle had Continental Marks on them. Hasbrouck found two that did not have army marks or brands, and asked Stillwell if he wanted to buy them. Stillwell declined both payment for his help or the animals in question. Cornelius decided to keep the animals without the marks in order to work them or if no one claimed them, sell them. John Simpson decided to purchase the cattle from Cornelius Hasbrouck being told that if anyone asked where he bought the two animals he was to say from the Continental drover. The cattle were driven to Benjamin Knapp’s pasture where they remained for a number of days when Stillwell became involved again by trading a mare with Simpson for the animals. Cornelius Hasbrouck was not content with the oxen he had stolen from the government, and then sold for a large profit. He became greedy, and approached John Simpson, asking him if he wanted to buy a cow he kept in his field by his mill. This time he admitted to Simpson that it was in fact a Continental cow. If he wanted the cow he could slaughter it at the home of John Stillwell, and divide it equally. Simpson was told to call on Benjamin Knapp and Martin Weygant, Jr., for assistance in the manner. Both Knapp and Weygant, in their own depositions, remembered that they went with Simpson to help him retrieve the cow at the mill of Colonel Jonathan Hasbrouck Cornelius’ late father’s mill. When the three arrived Knapp and Weygant refused to help Simpson because they felt the cow belonged to some poor old man because of the bell that hung around the animal’s neck. Simpson insisted it belonged to Cornelius Hasbrouck, but the two men refused to believe it. Simpson went to the Hasbrouck home, and having found Hasbrouck was eventually given an ox instead that was also in the field. Their fears were allayed and the three slaughtered the oxen; dividing it equally. Judge Robert Yates in a letter dated January 13, 1781, to Governor George Clinton included the sworn examinations of John Stillwell, and John Simpson. He alerted the Governor that Cornelius Hasbrouck had been tried and convicted in the theft of Continental Army Cattle. Governor Clinton no doubt was also made aware of the examinations of Benjamin Knapp and Martin Weygant, Jr. Judge Yates continued, “that Congress may upon your Excellency’s representation, appoint pursuant to a law of this State a procurator or attorney, for the purpose of commencing suits ags’t him” in order to recover damages from Hasbrouck. A second letter was penned the next day by the secretary of the New York Assembly, John McKesson to the Congress. In a letter written to the New York Delegates to the Congress, McKesso recounted the court case, and his belief that an example needed to be made of Cornelius under a law enacted by the New York State Legislature in 1779, which “enabled the recovery of Continental Demands (sic) and punishing the misbehavior of persons in Continental employ.” He advised it should the case for damages be pursued with great haste because Hasbrouck’s jail sentence expired in less than two months. Since Hasbrouck appeared to be a man of financial means, it would be easy to recoup the damages. Although Cornelius Hasbrouck was not the first individual to steal from the Continental Army it appears he was one of the more high profile individuals to be made an example by use of this law. Cornelius Hasbrouck, of Newburgh, was released from jail on “March 4, 1781.” He returned to his home in Newburgh, New York. Finally, it appears that almost eight months to the day he finished his sentence for stealing cattle; Cornelius was in trouble again for journeying to British occupied New York City without permission. Presumably arrested once again and jailed; he wrote a letter to Governor Clinton begging for his understanding, and assuring him he had no sinister motive. Cornelius threw himself on the mercy of Clinton and asked to be allowed to return home, and salvage his already ruined reputation. The Governor of New York seemed to have granted Cornelius mercy, possibly based on his knowledge of the family, his friendship with his Cornelius’s late father or an influential uncle, Abraham Hasbrouck of Kingston. Cornelius Hasbrouck of Newburgh probably was not a Tory. Instead, he was an individual who believed the army wronged him. There is no doubt that his neighbors, who in some cases suffered more than the Hasbrouck family, saw his actions as that of a crown sympathizer; a reason he might have been remembered as a Tory. His subsequent trip to occupied New York City probably cemented, in some minds, any doubt. A constant reminder to his neighbors was the visible “T” he wore that proclaimed he could not be trusted. Eventually Cornelius did leave Newburgh by 1800 the latest when a deed, in possession of the Huguenot Historical Society in New Paltz listed him as being late of Newburgh. Almost all traces of him disappear until 1818 when he draws up property transfers in the Town of Sandwich in Upper Canada for amongst other things his lands in Newburgh which he had not previously disposed of while he lived there. He also settled a dispute raging over the will of his late uncle Cornelius DuBois which involved his surviving siblings and other relatives. This dispute made it into the several newspapers of the time including a foreclosure notice. Cornelius settled the dispute by selling his lands to a Kingston, New York Attorney John Sudam and vesting power of attorney in him as well. Once this business was concluded Cornelius Hasbrouck disappeared again. Illustration: J. Tate Washington’s Headquarter’s Newburgh (Jonathan Hasbrouck House) 1869 in a private collection used by permission. The OCHS article goes into depth. It is also chock full of endnotes. If you are interested in this very awesome house I also have published two books on it.